Ah, Thanksgiving. How was yours? I spent my holiday back at home - which, for me, is Wisconsin. (You know, the land of cheese and Packers?) I never am able to get home as often as I like. The city is hard to be away from, especially because I don't have a car, but also because I feel like I am leaving civilization behind. Okay, so that's a pretty dramatic statement, but needless to say, going from city to suburbs is like going from 60mph to 25mph. Things move a lot more slowly back home, which is often more of a blessing than a curse for me. Coming home ends up being more of a breath of fresh air for me than anything else. It's akin to pressing the "reset" button on my life. 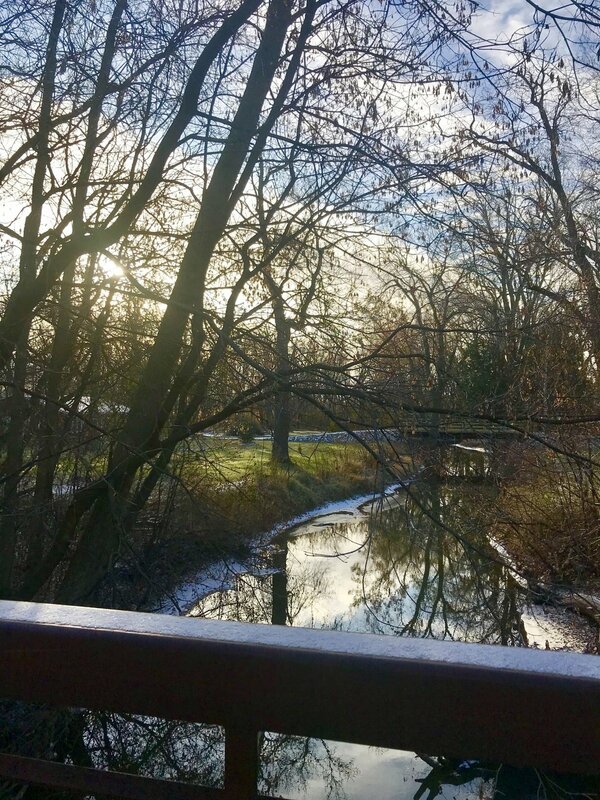 I gain perspective on the nitty gritty details that I get bogged down in when I am in the city. I also get to spend more time in this beautiful thing called nature that I don't see much of in Chicago. Before running, I made sure to check-in with my intentions. Was I running to "run off" those future pounds I would be putting on that day? (Which, in reality, is more water weight than anything else.) Or was I running because it makes my body feel strong and alive? For me, doing these mini-check-ins is important because it keeps me from slipping back into the "diet mentality" and focused on doing what feels best for me and my body. 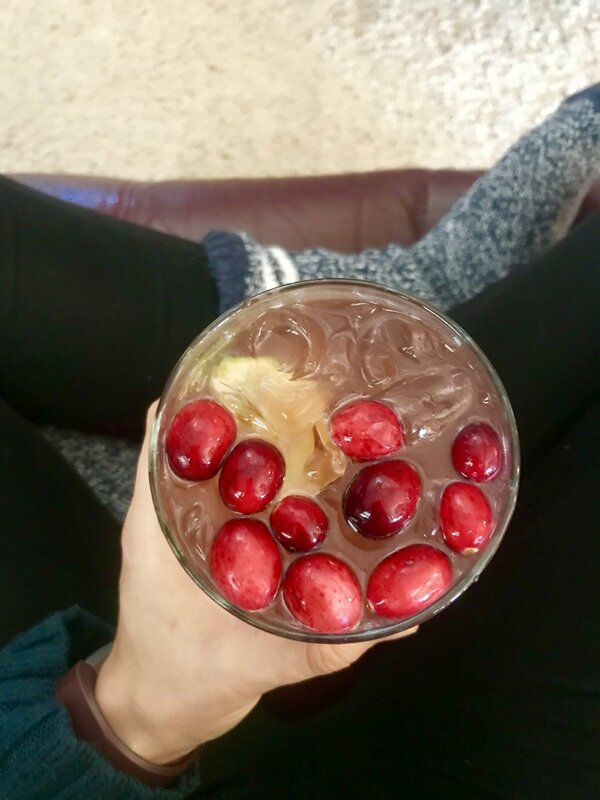 Momma made a tasty cranberry mule garnished with a fresh cranberries while my brother made the classic Wisconsin cocktail, the brandy old-fashioned. We sat around and caught up, sipped our drinks, laughed, and then, finally, it was time! 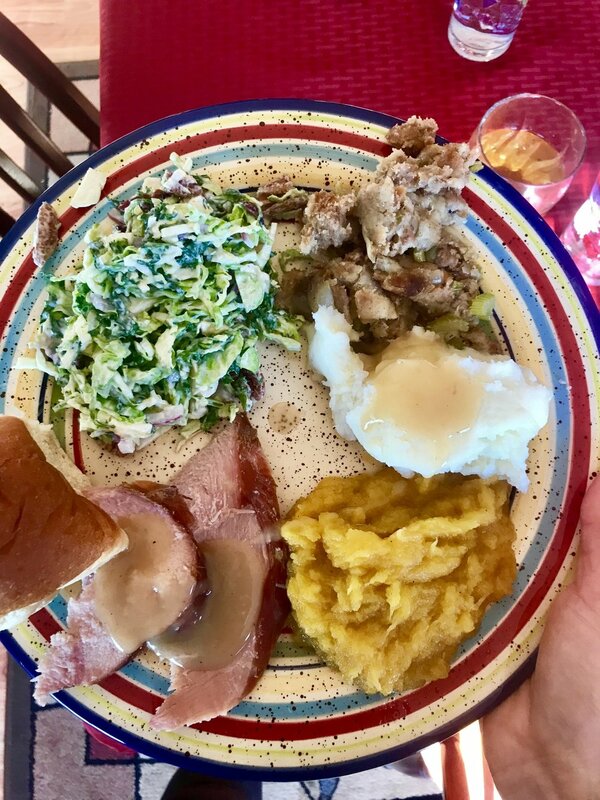 In the pic above you've got smoked turkey, fluffy dinner rolls, my Brussels Sprouts Salad, Grandma's stuffing and mashed potatoes, and Mom's acorn squash. What was doubly special about this meal was the fact that my brother shot the turkey that we ate in the springtime and had it smoked to preserve it. One of the things I really love about coming from a family of hunters is the true sense of "farm to table" it carries. My Dad, a deer hunter, taught me at an early age that hunting is beyond pure sport, it's about being apart of the circle of life (cue "Lion King" music)- respecting and honoring the lives of these creatures when we share them at the table. Today, and even last night as I helped myself to a second serving of apple pie, I fought the thoughts that were all too common for those consumed in diet culture. I won't have sweets for a month after this slice. Tomorrow, I am going to eat completely "clean" - no more indulgences! Although well-intentioned, these thoughts do nothing except make us believe that, by enjoying a rich meal, we have been "bad" and thus need to be "punished" in order to make up for it. But the restriction that follows is not sustainable - in fact, it's downright harmful. Think about how much you are enjoying the specific taste of a certain food. Take deep breaths as you eat and focus on how things feel in your mouth as you chew them. Find yourself wanting another helping? That's okay. Remind yourself that you can eat whatever you want and think about how you are feeling. Do you feel full or hungry? How do you imagine eating another serving would make you feel? Know that you can eat even if you do not feel hungry. Give yourself permission and gently remind yourself to be present while you are eating. Do not let diet culture rule over your life. Instead, focus on becoming attuned to your body and what it really wants. Replace those thoughts of shame and restriction with forgiveness and compassion. How was your Thanksgiving? What were your favorite dishes? I want to hear all about it! Share below!